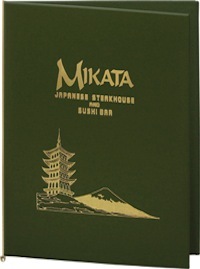 Traditional Menu Covers come feature a smooth faux leather texture and come in four traditional colors. Your folded menu inserts are held with an elastic cord or tassel (sold separately). No album style corners are included. Traditional Menu Covers are available in five popular sizes so you can create a coordinating menu cover ensemble including dinner, wine, and dessert. Traditional Menu Covers can also be customized with your logo. Holds one menu insert with elastic band or tassel.